A judge has denied a family's request to stop chemotherapy on Long Island teen Nicholas Gundersen. Greg Cergol reports. 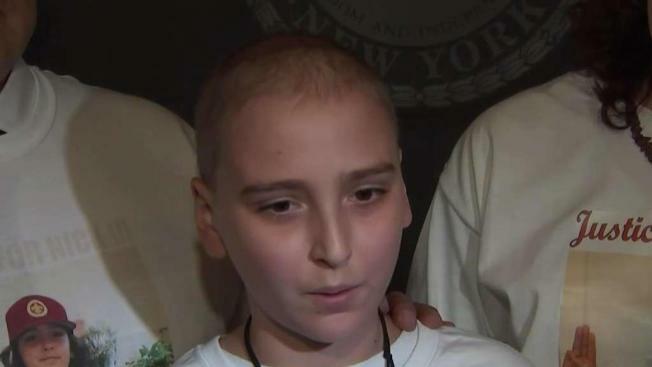 A 13-year-old Long Island boy battling a rare and deadly form of leukemia stood with his parents in family court Monday, sharing another disappointment as a New York judge rejected the family's emergency petition to halt his daily chemotherapy treatments. "I don't need chemo because I don't have any more cancer in my body," Nicholas Gundersen told reporters Monday. "It's difficult because every time I get it, I always feel sick. And I don't want to feel sick if I don't have to feel sick." The teen's cancer is said to be in remission, but his doctors at NYU Winthrop Hospital insist the boy needs 40 more months of chemotherapy. A spokesman for NYU Winthrop said previously, "Unless chemotherapy is continued, those [cancer] cells can once again multiply and the results are usually fatal." When mom Candace Gundersen decided not to continue chemotherapy treatments for her son, instead seeking a second opinion from other doctors and planning to focus on a non-toxic alternative therapy for the teen, Suffolk County's Child Protective Services seized custody of Nicholas. That move has blocked Candace Gundersen from making any decisions about her son's medical care. "It's very disturbing to me that the government has basically kidnapped my child," said Candace Gundersen. Nicholas was kept at at NYU Winthrop Hospital for at least a week with a special GPS bracelet to track his movements until a judge approved him moving into the custody of a family friend, where his mother was allowed to live with him. Family supporters came to court Monday wearing t-shirts reading "Justice for Nick." But the judge refused to grant the outcome they were seeking. "The judge is not listening to the constitutional rights of these parents," the family's lawyer Elliot Schlissel says. Dennis Nowak, a spokesman for the Suffolk Department of Social Services, said Monday night in response to the judge's ruling, "Child Protective Services is proceeding in accordance with the Suffolk County Family Court order, and will continue to do so to ensure the child's medical needs are met." The hearing for the case is scheduled for December, and the family is hoping it will be the first step toward regaining control of their son's medical care. Candace Gundersen told reporters, "I believe that in the end justice will be served, and that we will be free to take Nicholas and to take care of him properly."